Visual Studio Code>Programming Languages>styled-jsx Language ServerNew to Visual Studio Code? Get it now.  Integrates a language server for styled-jsx. The extension requires that the vscode-styled-jsx syntax highliter is installed. The extension will not work without it, because the vscode-styled-jsx converts template literals to language which can be detected by language server. 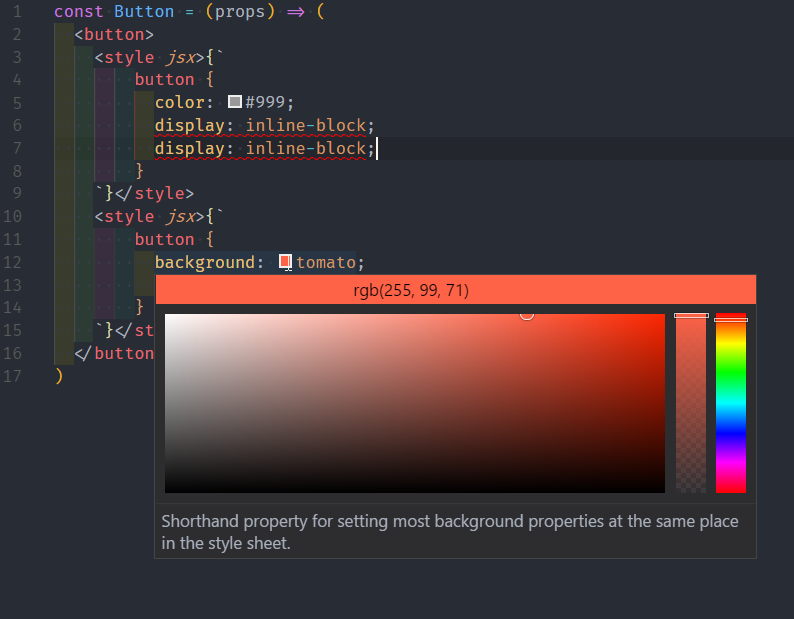 It works ridiculously simple 藍 The extension is fully made from vscode css extension sources. The main idea is to preserve characters number. This is neccessary for the laguage server in order to do completions in the right place, to underline problems on the right words, to highlight right symbols and so on. Also I've tried to make it as close as possible to the original vscode CSS language server. I believe that it supports all features which native CSS language server provides. Template literal expressions is replaced with whitespaces too. So there are no completions, hovers and other features for them. I don't know the way how it can be implemented. Extensions is synced to the CSS settings in vscode. If settings separation is necessary - PRs are welcome. Recognize react components class name as a symbol to make it possible to rename by symbol from CSS. Currently it can be done with Change All Occurences but be careful to not rename other things which have the same pattern. There is a registered applyCodeAction (but it isn't contributed in package.json) which I don't really understand what it does. Couldn't find any information about it. Maybe investigate into stylelint support. I will really appreciate any help. This is my first experience with typescript, vscode extension development and it is also my first repo that I contribute to open source (some files can be missing).